If you care to step outside of your startup, look beyond your #clouderati twitfeed, or take a break from your achingly futuristic unconference, to have a stroll in the workaday realm of Enterprise IT (for now, still the ruler of global business technology) you may be shocked and appalled to encounter the steadfast opinion that cloud is “nothing new”. Normal people, eh? Don’t they ever go to Cloudcamp? “It’s because nobody wants you to”. What on earth do I mean by this? Well in fairness I should clarify here; when I say “nobody” what I actually mean is, “nobody in your value network”. If you haven’t heard of value networks then you should check them out, because they provide some wonderful business analysis perspective; I’m referring to them here in the way that Clayton Christensen explains them in The Innovator’s Dilemma. Have a closer look at my picture above. I drew this to help me make sense of things, and help me explain my view to others (you could call it a cluebat). It might be an over-simplification for some folk, but it works for me. So this is how it works: you’re in a value network right now. It might even be one of the ones I’ve drawn. For most normal people just trying to get their work done, their value network largely tends to define their world view. We have the Enterprise IT incumbents on the left of the picture and the new kids on the block sit on the right. Broadly speaking we also see a product-centric on the left and a service-centric view on the right. The two value networks have fundamentally different costs structures and value perceptions, which is why none of the companies on the left have been able to compete with Amazon. 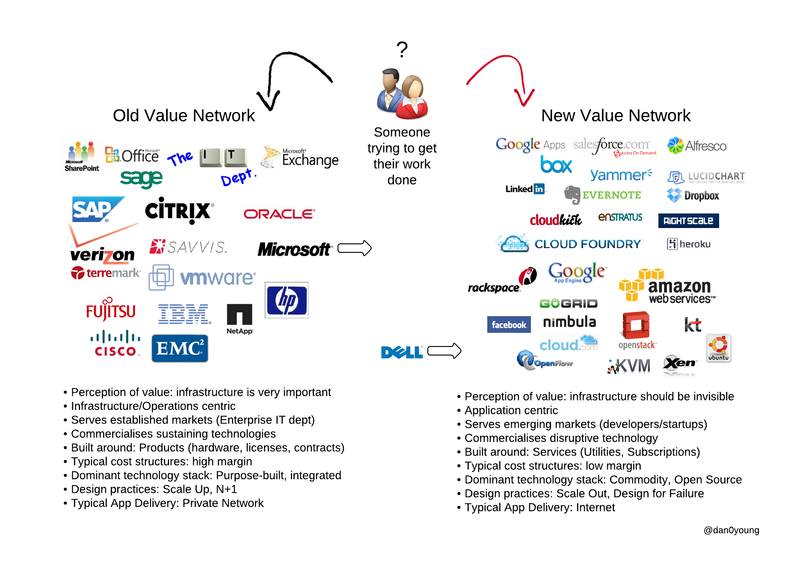 Not even the largest IT companies on earth have managed to compete because they are prisoners of their value network. Going back to my initial point, this picture also explains why if you work in Enterprise IT, and never stick your head above the parapet, your experience and understanding is dominated by the FUD and cloud-washing efforts of traditional vendors selling yesterday’s products packaged as a high cost “enterprise grade” services. According to Christensen, the only really successful way for a business to enter the new value network is a spinout strategy where you start a new business entity that is independent of the normal resource allocation process . This is what VMware have apparently done with their CloudFoundry PaaS. This is what Quantum hard disks did in the 90s, and what HP Deskjet printers did. It is how IBM survived the move from Mainframe/minicomputer to desktop PCs. Now I should point out that what I’m using to position these companies are their traditional core values as I perceive them. I’m aware that some companies on the left have made strategic acquisitions or have divisions in the right of the picture, but fundamentally their core business is based on the sales of high margin products. This is how they have created shareholder value and it’s what shareholders expect to be reflected in the financial results. When thinking about various companies strategic moves I am reminded of JP Rangaswami’s comments at this years Business Cloud Summit: We are seeing a radical changes in the IT industry. Are acquisitions at the edge, without radical changes at the core, enough to cope with this? I have tried to reflect movement in the diagram. You will notice that I’ve shown Dell moving mostly to the right because of their historic focus on relentless commoditisation of hardware. Microsoft also seem to be trying quite hard to find a place in the new world order, but we shall see if they manage to break across. Finally, right at the top of picture, you have the person who actually matters – the business user. This is the sharp end of the Consumerisation of IT or, as I think more aptly describes it, the Democratisation of IT. In a future post I want to examine a specific topic that relates to these two value networks – the concept of Carrier Cloud – and how I see the conflict between the two networks shaping the developments that are coming from the likes of Cisco and Alcatel Lucent. This entry was posted on	December 16, 2011 at 5:49 pm	and is filed under Business Models / Strategy, cloud.